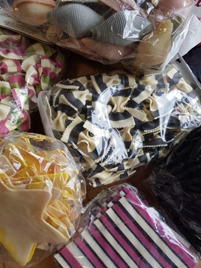 I am a sucker for buying different coloured and abstract shaped pastas, they are wonderful to contemplate when I open the drawer; good to know they have a long shelf life! 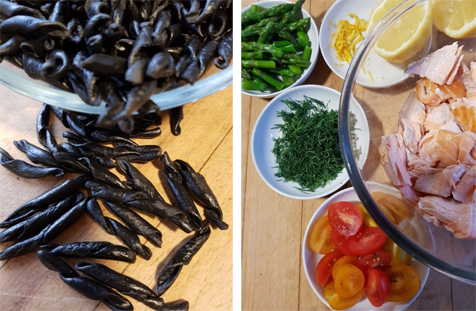 Always looking for a special occasion to use the pasta I was thrilled when I discovered the new AGA Turbot Square Serving Platter from AGA Cookshop and set to developing a recipe using nerelli black pasta to complement the colourings of this hand painted platter. It is a large serving dish which sets off food to its best advantage, whether a green salad with garlic prawns, pasta, grains or rice – I somehow feel a fish based dish is needed with the turbot design! The platter comes from Tuscany and as it is hand painted hand washing is required. This could be a fish dish to serve on Good Friday or it is good for a weekend lunch, served with a green salad. The sauce is made in an AGA 3 litre Stainless Steel Saucepan, as the larger diameter allows the wine to be reduced quickly without over-cooking the mushrooms. The saucepan can be placed in the oven so I could keep it warm in the Simmering Oven, whilst I made the rest of the dish. While the pasta is cooking – I favour the special AGA technique using the Simmering Oven, (see the recipe below) so I am free from constant watching to see if it boils over – the salmon can be roasted, it only takes 8-9 minutes. The final step is mixing the whole dish together and then the magnificent platter comes into use. The platter can be warmed by placing on top of an AGA Chef’s Pad on the Simmering Plate, the chef’s pad protects the stainless steel AGA lid. 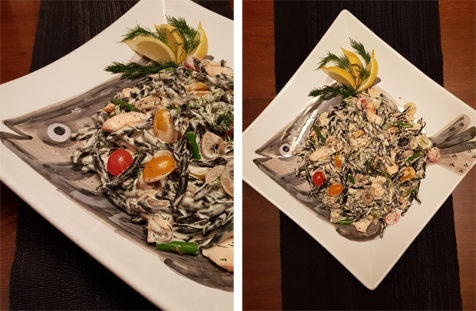 A striking dish combining black pasta, it is coloured either by squid ink or cuttlefish ink, with salmon flakes, dill and a white wine cream sauce. Place the mushrooms and wine into an AGA 3 litre Stainless Steel Saucepan. Simmer together on the Simmering Plate until the wine has reduced by half and the mushrooms are cooked, this will be about 4-5 minutes. 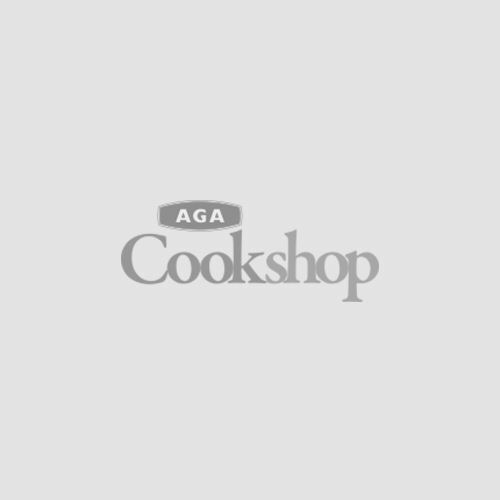 Pour in the cream, season and bring to the boil on the Simmering Plate for 2 minutes then cover and place in the Simmering or Warming Oven to keep warm – AGA Total Control, AGA 60 and AGA eR3 Series use the floor grid in the Simmering Oven. To cook the dried pasta, place into boiling salted water and cook for the time stated on the packet on the hotplate or hob. Alternatively use this AGA special technique. Bring 1½ litre of water to the boil in a 3 litre saucepan, add salt and pour in the pasta, return to the boil. Stir and cover the saucepan with its lid. 2, 3, 4 and 5 oven AGA: Transfer to the floor of the Simmering Oven (AGA Total Control, AGA 60 and AGA eR3 Series use the floor grid) and leave for the amount of time stated on the packet. Drain and replace in the saucepan but do reserve a little of the cooking water. While the pasta is cooking open roast the salmon fillets by placing them on a sheet of Bake-O-Glide set on the half size baking tray and slide onto the second set of runners down in the Roasting Oven, roast for 8-9 minutes. Remove any skin and flake the fish. Cut the blanched asparagus into bite sized pieces and slice the tomatoes in half. Take the cream sauce out of the oven and stir in the chopped dill, lemon zest and juice. Taste for seasoning. Tip into the cooked pasta together with the asparagus and tomatoes. Mix together adding any reserved pasta cooking water if required, then gently fold in the salmon flakes. Turn the pasta and salmon onto the AGA Turbot Square Platter and garnish with lemon wedges and sprigs of dill.